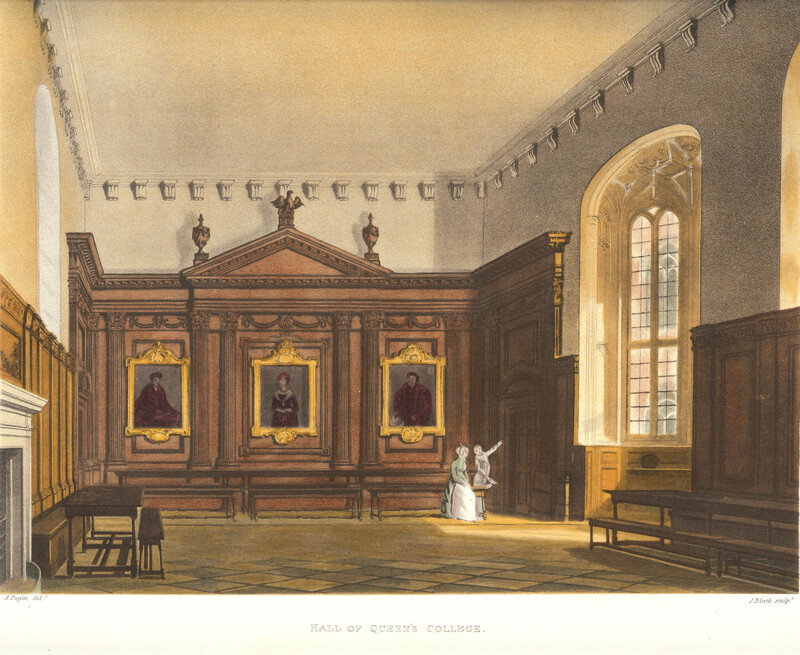 1449: The Hall was erected as part of the original College, now known as Old Court. 1531–2: Linenfold panelling erected (removed 1732–4, re-erected in the Servants’ Hall of the President’s Lodge, transferred 1896/97 to the President’s Study). 1548: Screens passage created between the external doors of the hall. By implication, the passage might have created a gallery above. 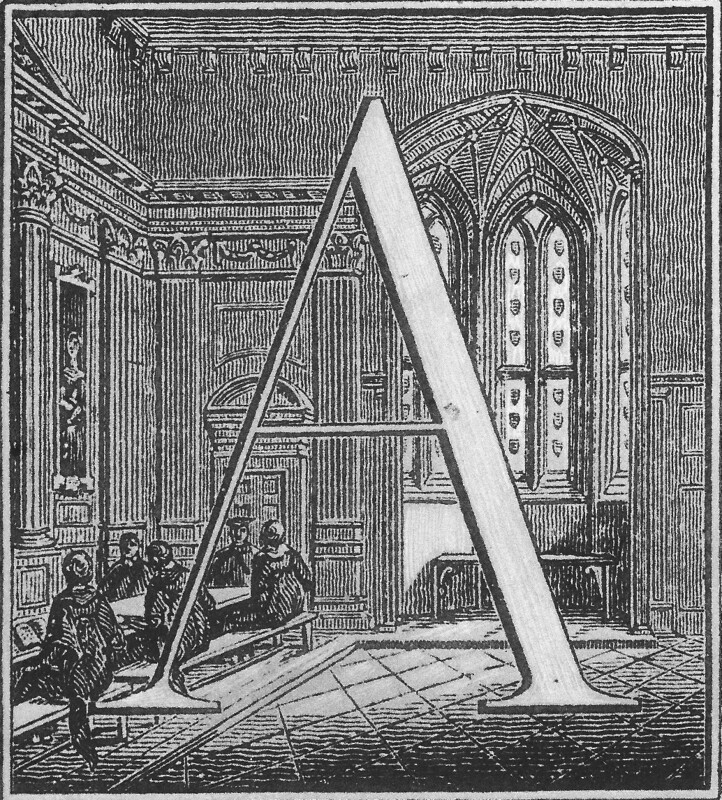 1640: Date of an inventory and assembly instructions for a demountable stage used for drama performances in the Hall. The Hall had been used for performances of drama from much earlier (as required by the Statutes of 1559): the practice ceased sometime during the Commonwealth period. 1655: Date on the dinner bell in the bell tower on the roof over the Hall, also inscribed “WB”. 1685: Loggan’s view shows dormer windows over the Hall, indicating that there might already have been attics inserted over the hall. 1732–4: The Hall was fitted up in its present neat and elegant manner [Plumptre MS] (that is to say, in a classical style). A flat ceiling with an Italian cornice was inserted just below the main cross-beams of the roof structure. The present classical-style panelling was erected. The architect was Sir James Burrough, the joinery was by James Essex the Elder (father of the James Essex who built the bridge and Essex Building), carving by Woodward, and the wrought iron gates to the Screens were by Jonas Jackson (the Jacksons were a Cambridge family of gatesmiths). In the gallery, a single central entrance door replaced two earlier doors on either side: these, now blocked, survive as cupboards on the south side of the wall. Sir Thomas Smith, statesman (the portrait), given by the third son, John Grey, Fellow-Commoner 1761–63. The portrait of Elizabeth Woodville is a three-quarter length copy of one of the half-length portraits of her at Queens’. The portrait of Sir Thomas Smith appears to be a copy of the one at Saffron Walden Town Council offices. 1780: Doors to the Hall were added behind the iron gates of the Screens. 1815: Print published by Ackermann of the Hall interior. The side windows are of reduced height compared with the present. The oriel window is shown here without tracery, and without stained glass. Drawn by Auguste-Charles Pugin, aquatint engraving by John Bluck. Published in A History of the University of Cambridge, its Colleges, Halls, and Public Buildings by William Combe, published by R. Ackermann in 1815. 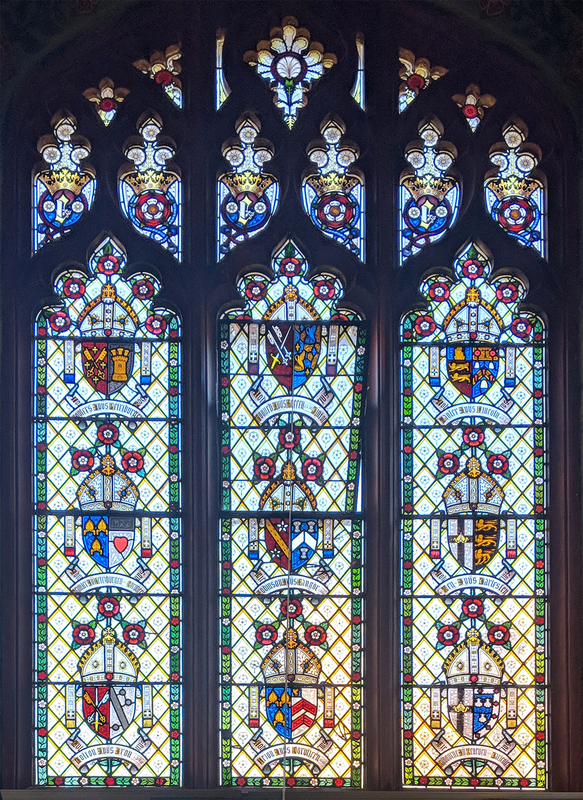 1819–22: Stained glass by Charles Muss inserted in the oriel and side windows (removed, sometime before 1854, possibly 1846, mostly transferred to the Long Gallery and to the Audit Dining Room). The glass was paid for out of a gift of 50 guineas from Isaac Milner in 1819, and benefactions from Philip, Earl of Hardwicke; George-Harry, Earl of Stamford; Sir Henry Russel, Bart. ; George Henry Law, D.D., Bishop of Chester; Henry Godfrey, D.D., President of this College; and many Members of this Society [ Commemoration of Benefactors 1823, p. 17n]. The arms of some of the benefactors were included in the glass. The total cost of the glass was £454 10s 0d [ AHUC , Vol. 2, p. 47n]. That the Earl of Hardwicke, Sir Henry Russel, & the Earl of Stamford having presented to the College their armorial Bearings in painted Glass, the Master do express the respectful acknowledjment of the Society of the Same. Agreed that the Master be requested to allow his Armorial Bearings to be placed in the window of the Hall at the expense of the Society. Agreed & Ordered that the Oriel Window in the Hall be completed by Mr Muss according to his Plan. This is also the likely period when embattled parapets (removed 1909) were added to the Old Court elevation of the Hall. 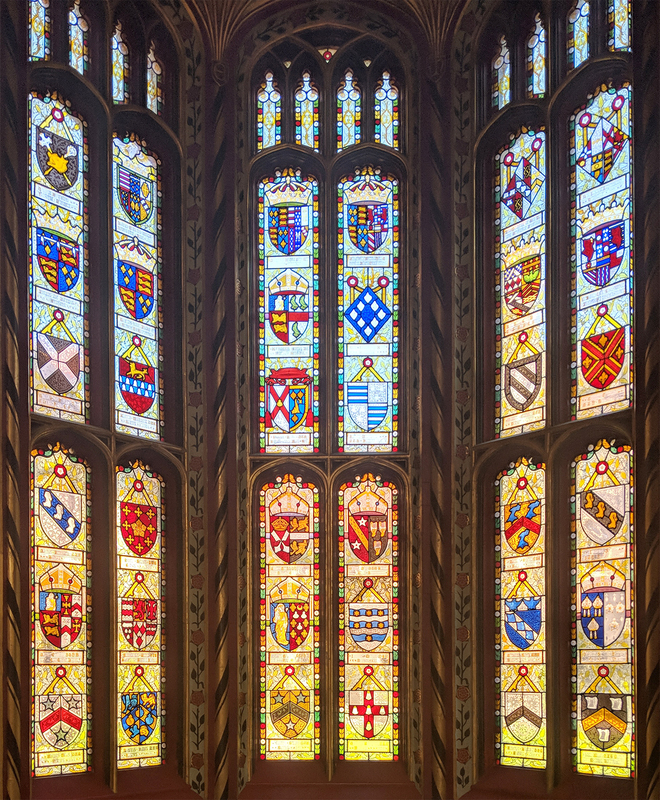 The stained glass coats of arms were inserted into the oriel window 1819–22, so this view can be accurately dated. In this view, it appears that a class is being held on High Table. Painted by Sir Wm. Beechey R.A. Fellow and Tutor of Queen’s College, Cambridge. 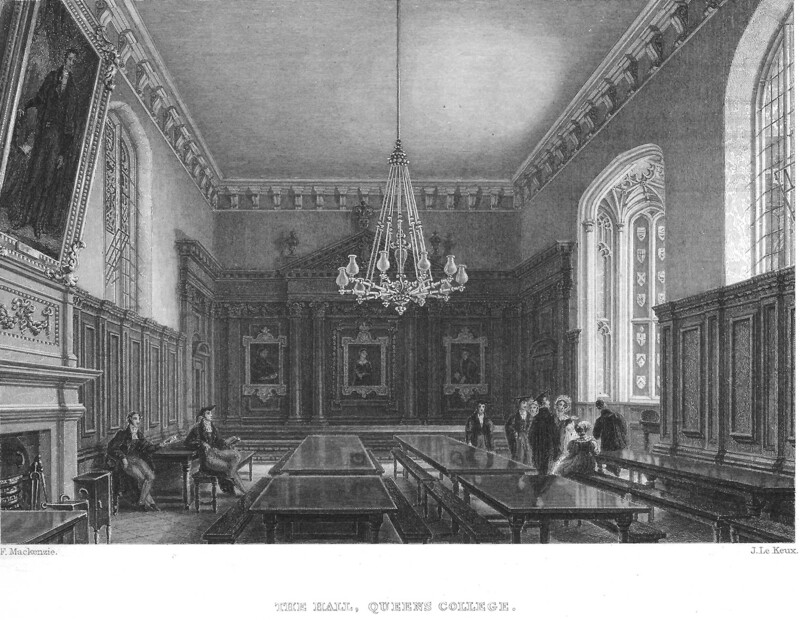 From the original Painting in the Hall of Queen’s College. Presented by the former & present Pupils of Mr. King, as a mark of their esteem & attachment. Published by Henry Leggatt & Co. 85, Cornhill, July 1831. At some later date, the original full-length portrait was cut down to head-and-shoulders, and is now in the President’s Lodge. 1836: This is the date enscribed on the decorative chimney stacks above the fireplace of the Hall. The stained glass of 1819–​22 can be seen in the windows, which remain without tracery. The 1830 portrait of Joshua King has appeared over the fireplace. A gas chandelier has appeared (ca. 1835?). Drawn by F. Mackenzie. Engraved by John Le Keux. 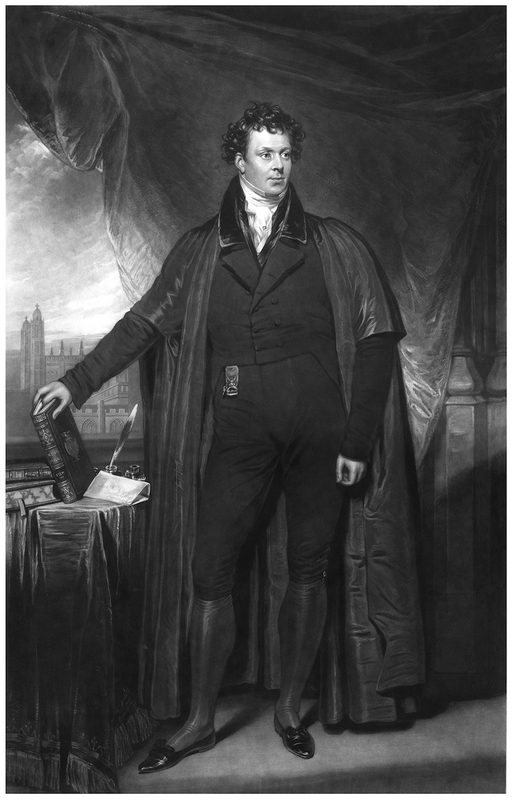 Published in Memorials of Cambridge in part form 1837–1842 by Thomas Wright and Harry Longueville Jones. Revised edition of Memorials of Cambridge by C.H. Cooper published 1860. Considerable restorations are contemplated in both the hall and the chapel of Queen’s College. It was but recently discovered how much mischief the paganizing mania of the last century had inflicted on these two venerable edifices. The roof of the hall proves to be the finest in the University, of beautiful high pitched open timbers, now underdrawn and totally concealed by a flat plaister ceiling. Considerable remains of the internal panelling still exist in the president's lodge. 1846: The flat ceiling was removed, and the roof restored, to the design of Dawkes, architect [uncertain whether this Daukes]. At this stage, the roof was undecorated. Tracery, also to the design of Dawkes, was inserted in the formerly plain mullioned side windows (but this was later replaced in 1857): possibly this 1846 tracery caused the removal of the stained glass of 1819–22. Records do not confirm whether Dawkes also added tracery to the oriel window, but the oriel window must have had tracery added before 1854. Dawkes put up a new dinner bell tower, and also created a louvre in the roof, which was an inappropriate act of restoration (the hall always had a fireplace, so would never have needed a louvre) — the louvre was removed again circa 1951. Agreed to present the thanks of the Society to Mr. Moon for his handsome donation towards the ornamental repairs of the hall. 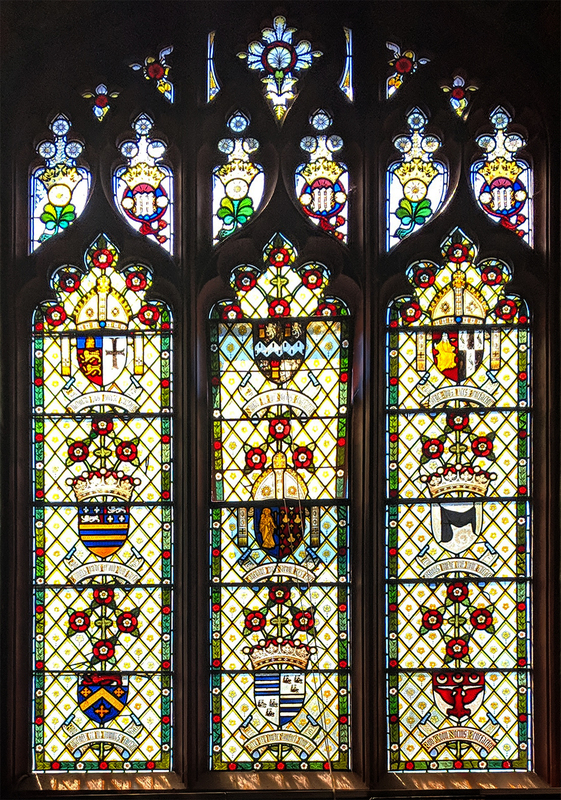 1854: The Oriel Window had the present stained glass inserted by Hardman of Birmingham, depicting the armorial bearings of the foundresses, early benefactors, and all the Presidents from Andrew Dokett to Isaac Milner (excluding those from the commonwealth period). The earlier glass by Muss 1819–22, if it had not already been moved, was removed to the President’s Lodge. Agreed that the thanks of the Society be presented to Mr Moon for his liberality in restoring the bay-window of our Hall, and in filling the same with stained glass. Top row: left: the Boar’s Head and the Arms of the College; centre: the two foundress Queens; right: the two principal benefactrices. Row 2: Four early benefactors, and the fathers of Anne Neville and Elizabeth Woodville. Rows 3–6: All the Presidents from Andrew Dokett to Isaac Milner, omitting the Presidents during the commonwealth period, between the two presidencies of Edward Martin. The arms shown for the 4th President, Robert Bekinshaw, are incorrect, and appear to be those of Grey/Booth, representing the 5th Earl of Stamford, a benefactor of the 1760s. This mistake seems to have been inherited from the earlier glass of 1819–​22, now in the oriel window of the Long Gallery. For a key to the arms, see Old Hall glass. 1857/8: The side windows were raised to their present height, and new tracery installed, to the design of John Johnson, architect. 1858/9: The present stained glass (by Hardman of Birmingham) began to be installed. On the east side, the stained glass shows armorial bearings of Bishops who had been members of Queens’. In the tracery are gothic letters ‘e’ alternating with red roses, both surmounted by crowns: references to the two foundress queens. 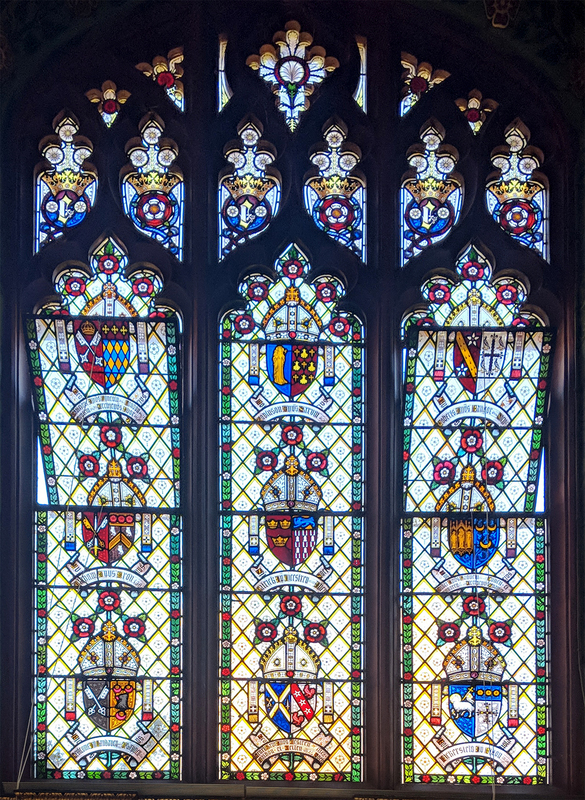 On the west side the stained glass shows armorial bearings of benefactors. The last window to be filled was the southern window on the west side (shown on the left), which includes the arms of the benefactor Robert Moon (bottom right) who paid for all this work. In the tracery are gothic letters ‘m’ alternating with white roses, both surmounted by crowns: references to the two foundress queens. 1861–4: The former fireplace was removed — the sawn off relics of the original clunch arched fireplace can be seen if you look up inside the present fireplace. A new fireplace was erected, by the architect G.F. Bodley, of alabaster and tiles. 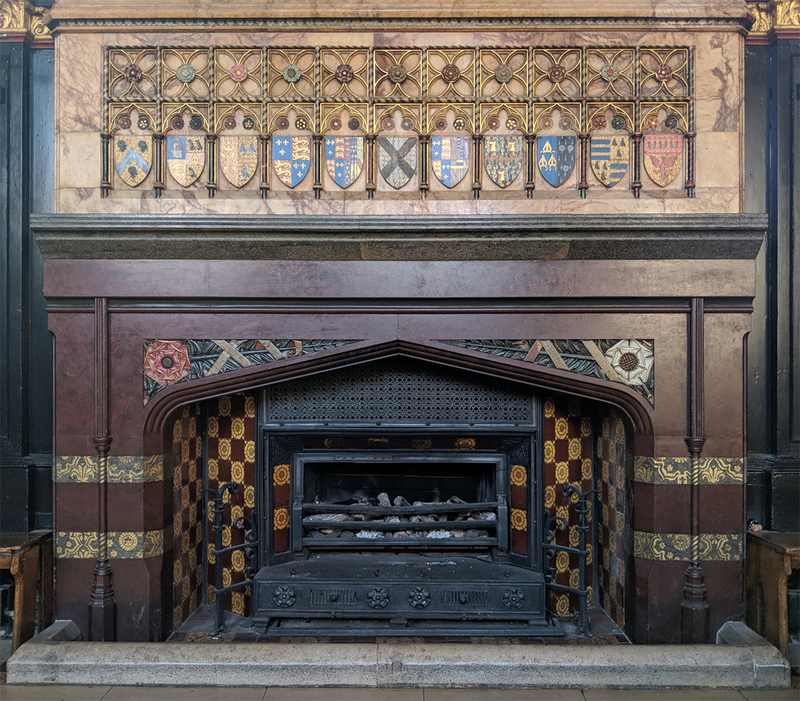 The decoration of the fireplace includes a red rose (House of Lancaster: Henry VI and Margaret of Anjou), a white rose (House of York: Edward IV and Elizabeth Woodville), and the college’s motto: Floreat Domus. Philip Webb designed eleven coats of arms, painted above the fireplace. A key to the arms is given in the table below. The tiles above the fireplace, depicting Labours of the Month, the two patron saints, and the angels of Night and of Day, were made by Morris, Marshall, Faulkner & Co. in 1864 to the designs of Burne-Jones, Morris, Madox Brown, and Rossetti. For more information on, and a key to, these tiles, see Morris & Co Tiles. 1862–3: A tiled floor was laid, using stone and encaustic tiles by W. Godwin of Lugwardine. This floor was removed and replaced by a reproduction in 2003: only the oriel window floor and some specimen tiles survive from this period. 1863: The saying of Grace before and after dinner was revised or introduced. All the work between 1846 and 1864 was paid for by Robert Moon, Fellow, whose arms appear as one of the benefactors in the west windows, and above the fireplace. He was elected the first Honorary Fellow in 1868. 1865: 22 chairs for High Table bought from Howard & Sons. 1873: Ford Madox Brown drew designs for tiles of Margaret of Anjou and Elizabeth Woodville, to be added to the tiles already above the fireplace (see 1861–4). The tiles were made by Morris & Co. for £24 10s. The college still possesses the original drawings. 1875: The present decorative scheme for the walls and roof was designed by G.F. Bodley and executed by F.R. Leach, for £345 18s 2d, including the gilding of 885 lead castings of stars in the roof. Each of the large stars weighs 14 ounces (0·4kg). A carved and moulded wood canopy to Bodley’s design was made by Cambridge firm Rattee & Kett and added above the Morris tiles of 1864. Hidden from view behind the wood canopy are the original wall decorations of 1875 by Leach, untouched by the later redecorations. The Latin Graces written around the walls are described here. The work 1873–75 was paid for by Campion, Wright, and Pirie, Fellows. 1900: The first electric lighting installed. 1948: It appears likely that the wall decorations were touched up for the celebrations of the quincentenary of the College. 1961: The wall and roof decorations were completely repainted, using stencils to reproduce the patterns (the original 1875 work had been painted free-hand). The colour of the panelling was changed from Bodley’s dark green to black with gold leaf relief on the advice of S.E. Dykes Bower. 1978: The Hall ceased being used on a daily basis, with the opening of the new dining hall and kitchens in Cripps Court. The fireplace was unblocked. From this time onwards the Old Hall (as it now became known) has been used for feasts, special functions, recitals, and receptions. 2001: Hall re-roofed with handmade tiles, thermal insulation inserted. Chimney stack over hall fireplace strengthened and repaired. 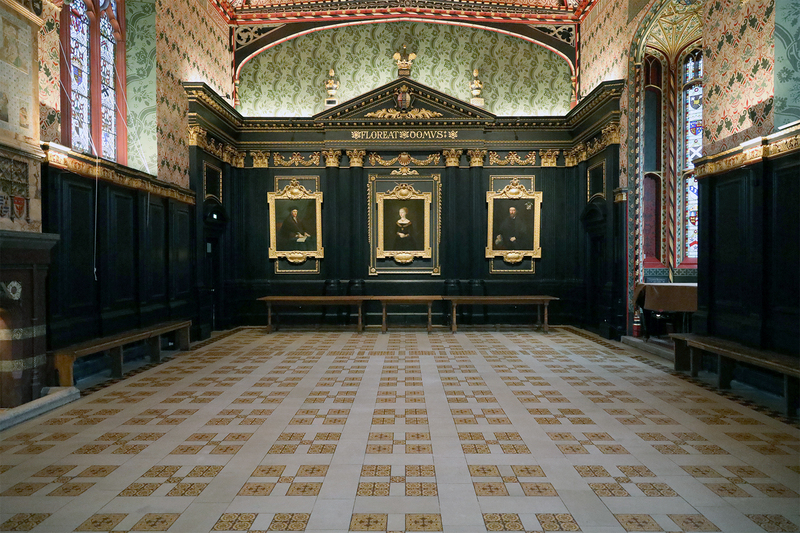 2003: The high-table wood dais and the tiled floor of 1862 were removed, to be replaced by a tile and stone floor in reproduction of the 1862 one, with newly made encaustic tiles from Craven Dunnill Jackfield. Where the previous dais had been, the new tile floor incorporated underfloor heating, enabling two visible radiators to be removed from the classical panelling. 2003: During the above works, an old crooked doorway was uncovered at the north-east corner of the hall, connecting with the diagonal window bay of the Combination Room looking out onto Old Court. This doorway had been blocked for many centuries by panelling on both sides. 2017: New LED-based lighting system, new P.A. and hearing aid induction loop. The decoration of the Old Hall includes elements that have meanings relevant to the history of the college. The Daisy was the badge of Margaret of Anjou, the first foundress queen, as its alternative name, marguerite, is her name in French. Daisies can be seen in the stained glass of the side windows, and along the top of the over-mantel. The Red Rose was the symbol of the House of Lancaster, to which belonged King Henry VI and Margaret of Anjou, first foundress queen. The White Rose was the symbol of the House of York, to which belonged King Edward IV and Elizabeth Woodville, second foundress queen. The civil war between these two parties for the crown of England is now known as the War of the Roses. Red and white roses can be seen on the fireplace, and in the stained glass in the tracery of the side windows. The angels (a) at eaves level, and (b) supporting the brackets for the tie-beams, all bear shields carrying a letter written in gothic (black-letter) script. The two eaves-level angels on the east side carry the letters E and M, for the two foundress queens: their counterparts on the west side carry the letters B and M for the two patron saints. The lower angels carry E and M on both sides. The letters M and E also occur at the top of the over-mantel, alternating with daisies. 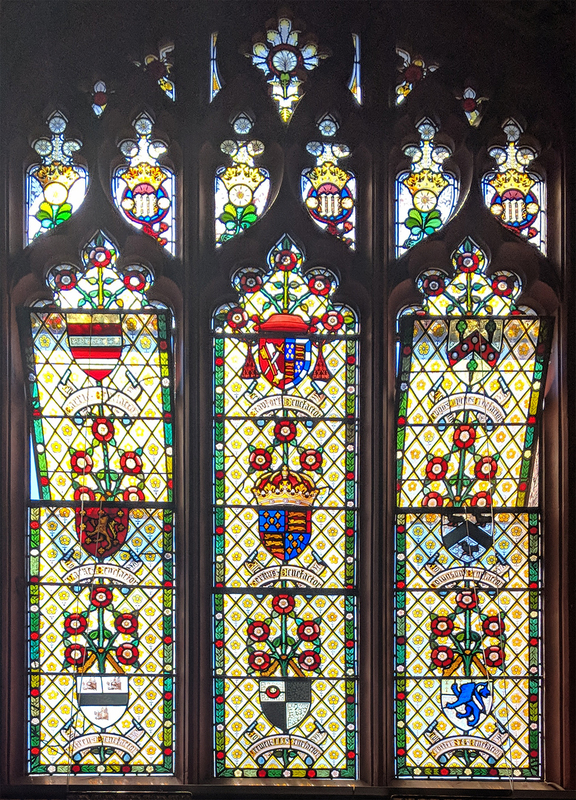 In the stained glass of the tracery of the side windows on the east side appears a row of alternating gothic letters e and red roses, all under crowns: on the west side, alternating white roses and gothic letters m. These are references to the two founding queens alternately. The phrase Floreat Domus is the motto of the college, meaning: May this house flourish. The armorial bearings of the college (derived from those of Margaret of Anjou) can be seen at the top of the panelling at the centre of the north end (behind High Table); the boar’s head badge can be seen at the centre of the south end, between the two entry doors from the screens passage. These two devices can be seen again at each end of the over-mantel, at the top. The painted tiles of the over-mantel, displaying the Angel of Night, the Angel of Day, and the Labours of the Months, could be read as having a theme of the passing of time: perhaps a gentle warning to the students? Drama and theatre at Queens’. Old Hall stained glass inscriptions 1854–8. The Graces of Queens’ College, with translations into English. Morris & Co. tiles 1861–4. 1837–​42: Le Keux’s Memorials of Cambridge , by Thomas Wright and Harry Longueville Jones, Vol. 1, pp. 264–​6. 1923: College Plays performed in the University of Cambridge , by George Charles Moore Smith. 1952: The Fabric , in Queens’ College 1950–​1951 , p. 6. 1961: The Fabric , in Queens’ College 1959–​1960 , p. 6. 1962: The Fabric , in Queens’ College 1960–​1961 , p. 9. 1989: Volume 2: Editorial apparatus . 2004: Queens’ College, Cambridge : archaeological monitoring of floor replacement , by Jess Tipper, Cambridge Archaeological Unit. 2016: The Heraldry of Queens’ College, Cambridge , by David Broomfield.